Non profit organizations need to recruit volunteers all the time. This can be done in many ways however embedding a recruitment form in your website is an efficient solution. The form is always there at night and on holidays), it delivers the information instantly and accurately, and the data can be easily synced with your CRM. This is why it is so important for the online volunteer form to be on your website. The website tells the story of your cause and the online form acts as a communication channel between the NPO and your potential volunteers. The online form enables you to automate these procedures of scouting, which can sometimes take much of your time. This way, using an online form helps to shorten the process and make it more efficient. Non profit are given many discounts and special prices so they can still use the best tools out there. Salesforce is a great example of how NPO’s are given the chance to use top-notch platforms, just like commercial business. Salesforce NPSP grant NPOs 10 free licenses as well as a large discount on more users. FormTitan form builder is another online tool that is well suited for non profits. Its pricing is lower than all its competitors and its capabilities exceed their competitors’ as well. There are endless types of workflows: You can find workflows for Human resources, Health care, customer service, Education, and even for the military. When you want to use a workflow it is better to make a sketch before and plan it carefully. This will help you understand the process better and help you identify potential problems before they occur. Once your plan is completed your sketch and checked it you can start creating your workflow. There are many tools for creating workflows. Businesses using online forms for collecting data and internal uses should consider using a form builder that has a built in workflow. The workflow is a visual diagram designed to automate business processes, routine tasks that need to be handled in steps in order to be completed. By automating your business tasks you improve the efficiency of your business. The data moves from step to step more quickly, the likelihood of errors grows smaller and it is easy to monitor the status of the task at any given step. The Signature – manual or digital? Businesses have to use signatures as part of their business processes and that is a fact. they use it, for example, to get a customer’s consent, a manager’s approval, or a sign of obligation. The signature can be used in many different purposes. Because of the fact that many businesses still use paper forms, getting them signed means that you need to print them out, have them signed manually and fax them. And online forms? what happens when forms are digital? In businesses that do use online forms instead of hard copy ones the electronic chain is often broken in order to add a signature to the digital form and this is surprising. This is why the digital signature is a good solution – it keeps the process online, streaming, fast and effective. If you need to create an online form and need to add a signature to it – what then? can you incorporate a digital signature in it? The answer is “Yes” – this can easily be achieved with a form builder, which offers Standard elements like textboxes, radio buttons or checkboxes. These are easily found in all form builders, but special elements like signatures are not always available, so you should check which form builder possesses the special elements you need. What is a “Salesforce form builder“? Is this important? Well…Salesforce is a leading online platform that works wonders with online forms. It stores data in objects and uses the online forms to collect the data online. Once data is entered in the form, it is automatically sent to the relevant Salesforce object and your Salesforce account is updated. By this integration you can also “Read” data from salesforce objects, and have it populated in your form fields. * Accounts: companies or individuals that are involved in a business relationship. These can be partners, customers or competitors. * Contacts: individuals within the accounts. * Opportunity: an event or activity for revenue generation. * Case: a problem which a customer may have raised. * Solution: the description of issues and their resolution. * Forecast: the estimated quarterly revenue of the organization. * Document: documents that are stored in folders for use in the organization. * Folders: holds the documents and determines the access to all the documents within it. NPO’s (Non profit organizations) use the money they raise to keep going. They need to keep expenses low and efficiency high. but how do you do that? Well, since non profits are not the only ones who want to contribute to society, you can find many companies giving considerable discounts and free use to these non profits organizations – and that’s their way of giving back to society..
Form builders also give large discounts, in attempt to help non profits. Since there are many form builders, you may want to compare them before choosing. Not all form builders have an integration with salesforce, which is important if you want to keep your data synced. next thing you should check is the connectivity. Make sure you can Read and populate fields from your salesforce objects, and not just update the objects in Salesforce. You’ll get regular updates from Facebook on how your adverts perform – such as how many people have seen your advert and how many engaged with it. And to make your adverts better based on how people respond, we’ll give you key details on advert performance and tools to make edits even after your adverts are published. Another off the shelf solution would be SyncSumo. SyncSumo lets you sync Facebook Lead Ads with Infusionsoft and retarget your contacts via Facebook Custom Audiences so you can generate new leads while also eliminating wasted ad spend.Pricing: Starting from a $30 monthly fee, price varies depending on the number of leads per month.Currently syncs with the following: SyncSumo is an invite only platform at this point, they claim to integrate with most of the popular lead management platforms. In less than a minute, you can connect your Lead Ad Forms with HubSpot, MailChimp, GetResponse, Active Campaigns, AWeber, and many more – we release a new integration almost every week! Once you’ve setup the synchronization, AdEspresso will add all of your new leads from your Lead Ads into the CRM of your choice! With our tool, you can finally stop wasting time with tedious tasks, and instead focus your time and energy on what counts: maximizing your returns from Facebook’s amazing Lead Ads! This is our recommended fb sync tool tool. 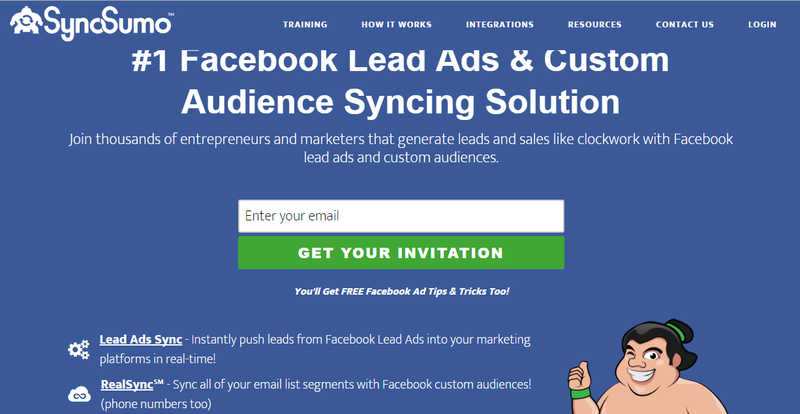 Leadsconnector bypasses the facebook work method of ‘leads-to-CSV’ and drives the leads straight to your email and 3rd party platforms. It provides an easy and free sync. Currently both the sync to email and the 3rd party integration are completely free. Do you use Facebook lead ads?Good for you!Facebook is a great advertising platform. The facebook lead ads are easy to use, have many targeting options and generate lots of leads. The Lead ads makes is simpler for people to fill in online forms – Instead of sending traffic to a landing page where people manually fill out a form and press submit, they click on the ad, their information (name & email) is pre-populated, and they hit submit. All within the Facebook platform. Lead Sync gives you the ability to sync Facebook Lead Ads with email marketing platforms and other services in REAL TIME. Updates are not in real time. Easy automation for busy people. Zapier moves info between your web apps automatically, so you can focus on your most important work. You can use Zapier to connect your facebook ads account and send the data to any integration point or CRM supported.What Zapier can do in a few minutes of setup used to take days with ongoing discussions with development teams and tests, we recently wrote about how to setup multi taks zap in another blog post. LeadsBridge connects your Lead Ads campaigns to your CRM tool/Autoresponder and lets you import them instantly, all without having to manage CSV files. Lead Ads is the new ad type recently introduced by Facebook that lets you easily collect leads thanks to their prefilled forms. The problem with Lead Ads is that you can’t store these leads anywhere other than a simple CSV that Facebook lets you download. LeadsBridge connects your Lead Ads campaigns to your CRM tool/Autoresponder and lets you import them instantly, all without having to manage CSV files. With LeadsBridge your marketing automation is safe. You can run Lead Ads campaigns and instantly send subscribers your opt-in offer, without any complex manual work. 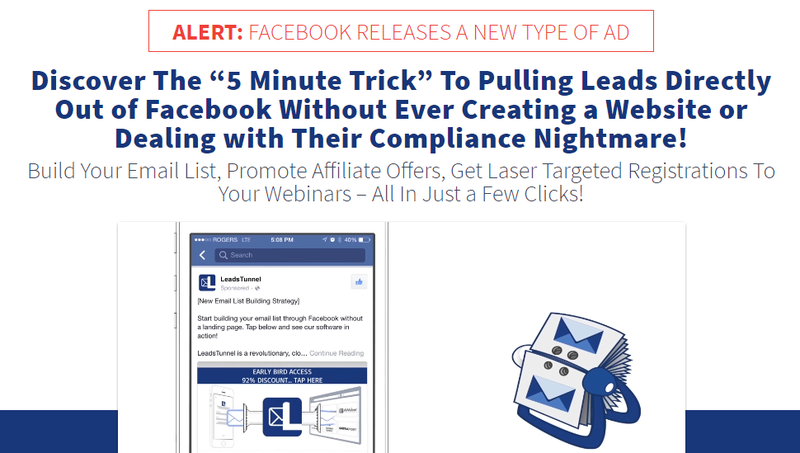 ConnectLeads gives you an easy-to-use system to build your subscriber lists automatically on Facebook via its hot new Lead Ad feature. No need to be a Facebook ads expert, hire outsourcers or spend hundreds/thousands of dollars on dedicated apps. With ConnectLeads, you will have everything you need! Now, virtually any business can leverage Facebook ads to the max! With NO technical experience or special knowledge needed. Leads Tunnel is a cloud based software that connects the brand new Facebook Leads Ad system to your favorite autoresponder, CRM, or webinar platform. 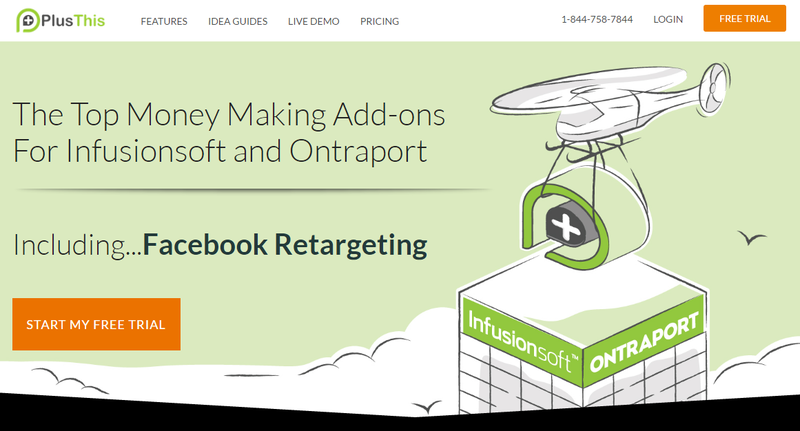 Infusionsoft is a popular sales and marketing automation software for small businesses combining CRM, email marketing, lead capture and e-commerce.PlusThis is an Infusionsoft Add-on For Facebook Ads that will sync your facebook leads straight to Infusionsoft. Explore the library of PlusThis features. Increase the capabilities of your Infusionsoft marketing with dozens of features that allow you to increase leads, conversions and automation. Connectio aims to offer the most powerful Facebook™ marketing tools available to businesses and enterprises of any size. 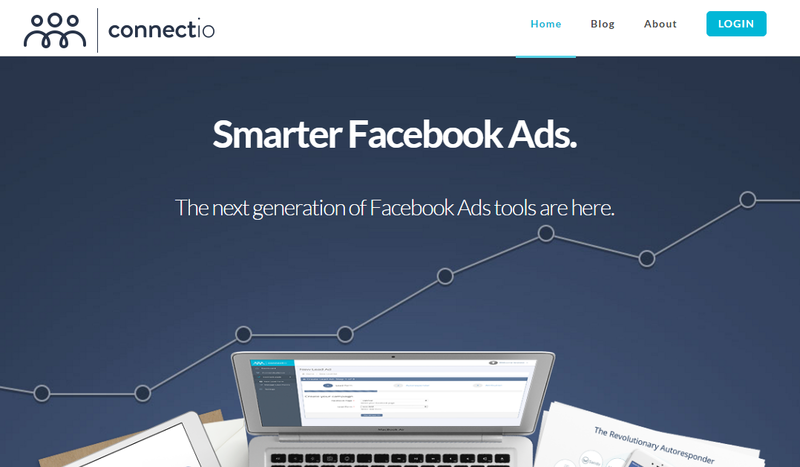 Based in Utrecht, The Netherlands, our global team has developed a range of tools to get more results using Facebook™ Ads.Being active Facebook™ advertisers ourselves, we created various tools to make our ads more effective – which is how Connectio was born. Over the years, it’s become painfully clear to us that many businesses struggle to get Facebook™ Ads working for them – while it is (by far) the most rewarding ads platform out there. That’s why we decided to start sharing our tools with the rest of the world – empowering other Facebook™ advertisers with the same competitive advantage we have. Connectio aims to become the standard that every Facebook™ advertiser is using to make their ads more effective.Whichever direction things take in this space, we are confident that you will find Connectio to stay on the leading edge, ensuring that our customers will always have a distinct competitive advantage. Sync a list in your CRM once, and we keep it up to date for you by adding and removing contacts every 3 hours as they change. Offers integrations from many 3rd party platforms such as mailchimp, intercom, infusionsoft, sparkroom etc. Our experts show adverts to all the right people based on age, gender, location, interests and so much more. Facebook offers powerful and unique ways to show your adverts to the people who are most likely to care about your business. You can reach your goals by reaching the right people. The adverts we offer are designed to help you get the best possible response from the people who see your advert. People use Facebook to discover what’s new with their friends, family and the things they care about. And your adverts are shown alongside these stories – seamlessly – on both desktop and mobile. You can optimize your Facebook ads using FB API ads Manager Tool with Facebook lead Ads Integrations. See how your Facebook ads are performing with high ROI. Do you use Facebook lead ads?Good for you! Facebook is a great advertising platform. The facebook lead ads are easy to use, have many targeting options and generate lots of leads. The Lead ads makes is simpler for people to fill in online forms – Instead of sending traffic to a landing page where people manually fill out a form and press submit, they click on the ad, their information (name & email) is pre-populated, and they hit submit. All within the Facebook platform.